I am a Christian and your GOOHF cards are leading people further into sin. (Knowing how dumb some Americans are, they probably believe they won’t go to hell with those cards.) Why do people make hell look good? Just wait till you get there, then we’ll see who thinks it’s really good. Surely God’s going to punish you for leading His Children further into sin. Oh, and when He sends you to hell, make sure you have a GOOHF card with you–not that it will help, but Satan might find it amusing! Stop trying to play games with me. You know what I mean. Why do you distribute those cards?? May God forgive you for any souls you have led astray. This matter is serious. Who do you think you are–what authority do you have to ‘Get people out of Hell’? You work for Satan if you publish things like this: [the American Taliban story about Pat Robertson in last week’s issue.] The people in that report are nowhere near true Christians. So it’s “Satan’s work” if I write about how stupid people are who profess to be Christians, but really aren’t, according to him. And he demands to know “who I think I am” to issue cards he says don’t work? My, how confused the not-quite-secure-in-their-faith types can be. It’s apparently OK if I write a story criticizing non-Christians, but God forgive me if I write one with the same sort of criticism of a “nowhere near true” Christian. Or, no, gee: that’s not it. Or is it? Whatever. I guess he’s afraid that someone, somewhere, just might be mocking him because he isn’t sure what he believes. And that’s terribly, terribly sad. I get this sort of mail all the time. But at the same time, I get mail (and, yes, orders for the GOOHF cards!) from “true” Christians — including the clergy of many, many different denominations — who not only have a clue, but are secure in their beliefs …and have a sense of humor. Priests and ministers and rabbis from Roman Catholic to Methodist to Baptist to Lutheran to Jewish Orthodox to Pagan to whatever have the cards (and other GOOHFy products) and enjoy and share them. None think it’s a license to go out and steal and kill and covet thy neighbor’s wife. And anyone who thinks they do really needs a life. So William, I have something for you. Send me your mailing address and I’ll send you a free GOOHF card. But you don’t have to worry for your eternal soul: it’s stamped “VOID”. I enjoy most of your comments, but I gotta say, I think you’re taking advantage of your wide readership to devote so much of your column trying to make one reader look like a fool or stupid by your rant on his opinions. So what if you don’t like what he wrote? It was in a private discussion with you; your responses should have remained as private. What was the point of insulting him in front of quite a bit of the whole world? Other than trying to get the last word in and publicly insult him, that is. That’s pretty small of you, knowing that he doesn’t have recourse to treat you as meanly. I expect more from a person of your stature and intelligence, but I realize that this is not the first time you have resorted to this type of dirty fighting, and know also that, unfortunately, it won’t be the last. I’m not sure what Marina expects when someone writes a letter to the editor of a publication to express an opinion (just as she did), but let’s examine this. First, as far as me being “unfair” to ranters, someone else long ago put their finger on it: it is unfair to have a battle of wits with an unarmed man. So what? Second, I didn’t make William “look like a fool or stupid” — he did. This is your way of baiting the public, daring one to disagree with you, thus providing more grist for your mill. Your version of letting 100 flowers bloom, Mr. American Mao? Do not reply to this; I will never see your letter, it will go straight to trash. So publishing a letter to the editor is “baiting” readers — but don’t dare present any argument to that because she’s slamming her mind shut? Um, yeah: that’s an intelligent, thoughtful approach. Previous Post: Civil Rights: Justice for All, or…? One of my mentors, Brother Dave Browning, was asked the difference between Religion and Spirituality. Ya know, I really have to smile at these people. Do they really think it’s smart to make their God so petty that he’d be mad over GOOHF cards? The part about people insecure in their faiths hit the nail right on the head. As a practicing Christian (I’m a full time youth minister), I won’t apologize for the GOOHF letter you got from a ‘Christian’ but I do want you to know that 1: Some of us do have senses of humor; 2: Get the joke; and 3: Are the not the incredible tight asses that seem to get all the media attention. I’m quite sure that God finds your GOOHF cards as funny as the rest of us do. Oh and just to offer a little theology here: Christians believe in something called GRACE. So with all due respect to my brother in Christ who wrote, wake up and get over it. ‘Stupid Americans’? Real Christians treat others with respect and tolerance. Tell William maybe he should re-examine his own faith before he tries to ‘save’ others. Last night I went to a Janis Ian concert where she told a tall tale about southerners who wanted to baptize her, over her protests that she was Jewish, and how they said God wouldn’t mind. So I gave her one of the plastic GOOHF cards. She seemed to enjoy it. I appreciate your keen logic in dealing with ranting nuts. As a Christian, I’m SHOCKED at some of the things that come out of the mouths of people who share my faith, and those people need to be taken to task. For what they believe? No, for not thinking. I love your cards, I think they’re comic genius. I can’t imagine why anyone would think they’re anything but. I think if someone gave one to me when I was having a hard day, I’d probably laugh and it would make my day. Making someone feel good? Reminding them it’s not all that bad? Hmmm, that sounds like a very Christ-like ideal to me. Perhaps even a form of ‘Love they neighbor’. But what do I know? I’m just a stupid not-really-a-Christian American. I just wanted to say thanks for not bashing the Christian faith just because someone sent you a nasty email. You had an opportunity to do it and you took the higher road. I appreciate your discernment. I think that the fact that you posted his letter at all (and, if history is any indication, would probably post any reply he might have sent) does let him “have recourse to treat you as meanly.” And, on your own site, to boot! William certainly sounds like an Expert on how terrible Hell can be, so I have to wonder if he’s speaking from experience. And what did HE do to warrant such punishment? Since we all agree that Hell is eternal, I surmise that he’s now stuck there forever. Too bad he didn’t have his own Get Out Of Hell Free card. If you would like a wee taste of what HELL truly can look like, GO to Zimbabwe, find William and live with him for a month. I understand Nick in Albany’s comment to mean MENTAL hell. Because having to deal with his holier than thou attitude for a month would surely stretch my patience…. I just don’t understand why some people think they’ve got the monopoly on knowing what’s morally right or wrong – and are offended if someone else has a different opinion. Don’t pay any mind to those arrogant idiotic twits who pontificate as if they are the source of all the world’s knowledge and beliefs. William from Zimbabwe deserved your retaliation, and Marina in Washington needs to have the mental equivalent of a bright light shining into her eyes. Seems to me if he is still reading True then, from his perspective, he is “flirting with the devil” and has already allowed himself to become corrupt. Uh, oh, my bad! I was using logic there, something that clearly has no place in William’s world! Is the seeming delight expressed by “Christians” like William at the prospect of a fellow human soul suffering eternal agony representative of Christian love and charity? If the Gospels are true, the Saviour took so little delight in that prospect that He took that suffering upon Himself “that we might be saved” from that fate. Secondly, perhaps William would like to advise “dumb” Americans on how we can make our country as notoriously safe, free, peaceful and prosperous as Zimbabwe and other African Utopium. Last, lighten up, buddy! Life’s too long to live like that. Humor is a wonderful salve, and Christ himself used it to make a point (see His analogy of the guy with the “beam” in his eye trying to remove the “mote” from the eye of his brother!). –With Best Wishes and Warmest Regards, A Fellow Mortal. 1. People who avoid doing Evil only out of Fear of Hell and do Good only for the Promise of Heaven are not actually “Good”; they are merely efficient calculators of what’s best for them. 3. OTOH, Truly Good people may enjoy the humor of GOOHF cards (thus earning Divine Favor … God loves a joke!) but will never do Evil even with a full deck of GOOHF TIG-welded to their souls…. because Evil is, you know, EVIL! And they’ll continue to do just as much Good as before, because that is their nature. 4. Therefore GOOHF Cards help sort the Evil from the Good. Q.E.D. This William fellow is obviously obtuse. If he wasn’t he would realise that a GOOHF card would be very useful to him in Zimbabwe. The Zim dollar certainly won’t do it, and Zimbabwe is hell on earth, isn’t it? I know someone in Zim who earns a salary of 80 Billion Dollars a month. That is probably worth about fifteen US dollars on a good day. Your offer to VOID a GOOHF will have me grinning privately at the brilliant humor for days. 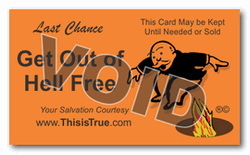 Wouldn’t it be fun to be able to stamp void on a GOOHF card every time a non-thinking Christian fussed about the idea? I am still trying to wrap my mind around one question though. When you void a GOOHF card does it become a GTH card? William’s need to believe in a hell reminded me of a family story about my great-grandparents who were “universalists” in the 1800s. Taking the preachings of Jesus about the love of God literally, they believed that there was no hell in the after-life and that everyone went to heaven regardless of their beliefs or actions. I’m confident that the correspondent William means well, but as Dan in Philadelphia mentions, there are “universalists” and, in fact, there are and have been Christian universalists from the earliest days of the church. The global reticulum is replete with websites regarding this teaching, but for “one-stop shopping” I might recommend “tentmaker.org,” which has many links, articles and New Testament scriptural citations in support of this doctrine (e.g. : John 1:29, “the lamb of God that taketh away the sin of the world;” I Timothy 4:10, “God, who is the savior of all men, especially of those who believe;” and I John 2:2, “He is the propitiation for our sins, and not for ours only, but also for the whole world”). Apparently a majority of early church “schools” and a number of those best-known early Christian teachers taught ultimate universalism. A lot depends as well on the meaning of Hebrew and Greek words rendered into English as “hell” and “eternal,” as understood by the Biblical writers. This site goes into all of these matters and much more. Incidentally, even the widely respected evangelical writer John Stott dared to suggest that even if one doesn’t believe in an “apocatastasis,” or ultimate universal reconciliation (which is considered “[Theologically] possible but not [established] doctrine” in Eastern Orthodox teachings), it is Biblically arguable that at least unregenerate souls might experience “annihilation” rather than eternal torment. As the pre-Christian Jewish sage Antigonus of Sokho wrote, there is something noble about doing “good” for its own sake rather than in hope of a reward in this life or in an afterlife, though that does not in itself preclude such gracious Divine blessings. The comments on historical Universalism prompt me to weigh in on current Unitarian Universalism, my “religion”. Built on the twin pillars of Unitarianism (God is one, not a trinity or any other number greater) and Universalism (Salvation and and after-life in heaven for everyone), UUism has morphed into: Belief in God-optional; belief in the afterlife-optional. What is not optional, what we believe is essential to the survival of the human race is this: Every human being has value, is significant, matters. How we relate to our fellow human beings matters. This really made me laugh. You WILL let us know if this happens, won’t you? Ya know, Randy, I think I’d like to have some of those GOOHF VOID cards. I know some people who’d enjoy them as much as the originals. As for William, he’s not really worth the time to type a tirade about. SHEESH! Interestingly enough, people always seem to the “Hell” in GOOHF as religious. I’ve started handing these cards out like candy on Halloween to my co-workers. From the stories that I have heard about other companies, anyone who has had their company go through a conversion to SAP understands all too well what “hell” can be…. Though to an earlier comment, it sounds like Zimbabwe may be its own type of hell as well. After reading this article, I wondered: given on what the GOOHF cards are based, have you ever considered printing a companion set of “Go Directly to Hell” cards (do not pass Go, do not collect $200)? Oops, guess that clinches it; I’m going to hell for my cavalier attitude.